Interesting spider graph at ECC2015 on Dabrafenib and Trametinib a known combination of a Braf inhibitor and a Mek inhibitor. 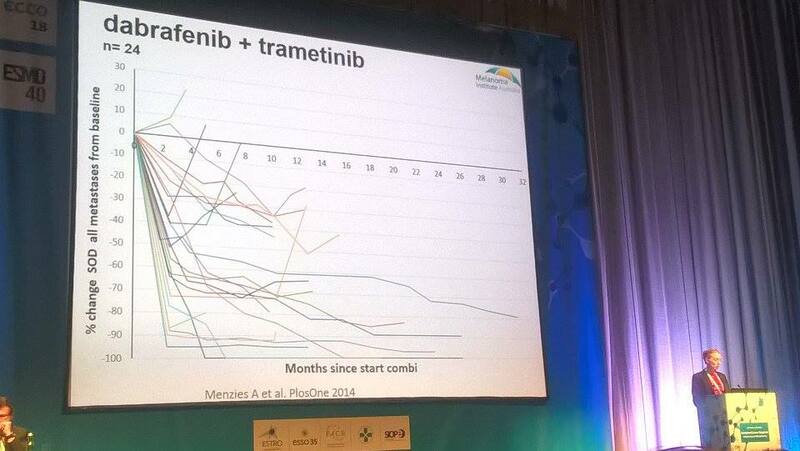 A subset of patients can make it longer than others -meaning that their tumour resistance to the treatment is occurring much later (>2 years). As seen patients with a slow reduction of tumours tend to stay longer on treatment than the ones experiencing a rapid shrinkage. both combination Ipi +Nivo or Nivo alone. 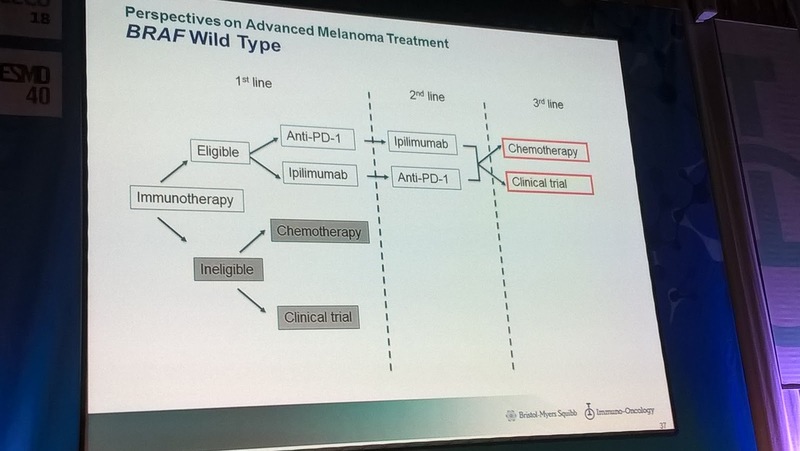 Patients wild type respond better to combination Nivo+ IPI than to Nivo alone. 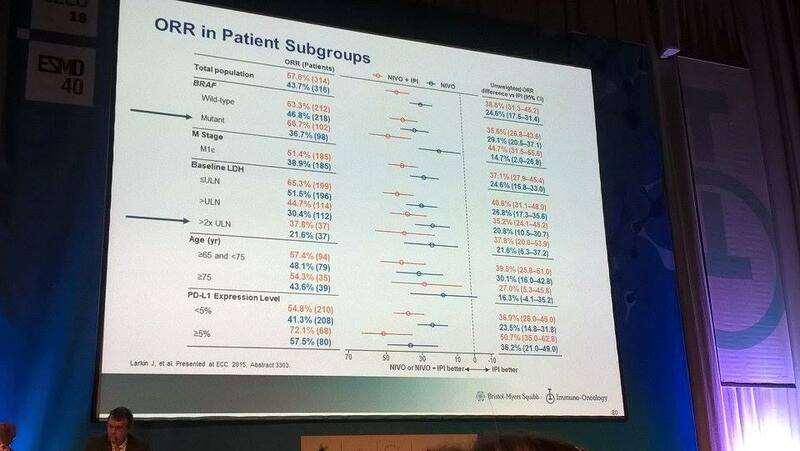 Finally patients with lower LDH have respond the best to both treatments (combi or mono). Efficacy of treatments for the total number of patients is known from ASCO2015 -median PFS is 11.5 months for NIVO + IPI versus 6.9 months for NIVO alone and 2.9 months for IPI alone. 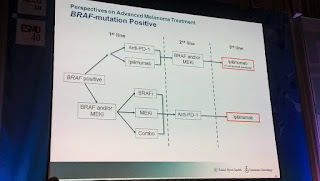 Treatment options for both Braf positive and Braf wild melanoma. 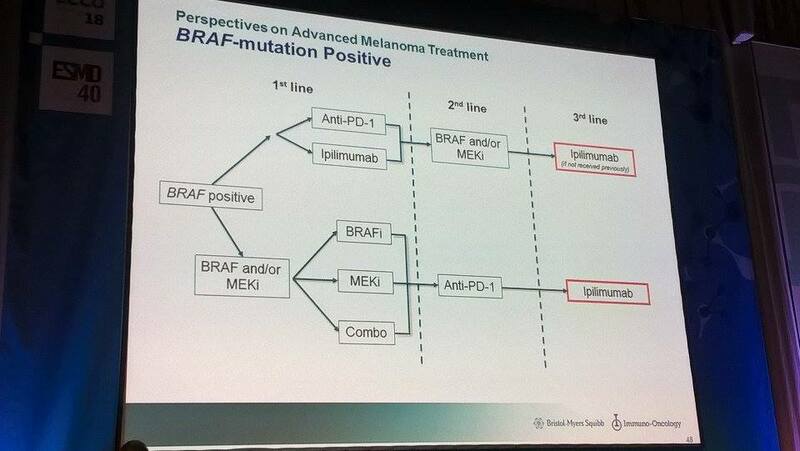 Obviously there are more choices and opportunities to alternate the treatments for Braf positive patients. Chemotherapy is the last option. Strict monitoring at 6-8 months looks essential to early catch the disease progression. 13% patients had additional mutations at the beginning BUT it has no effect on response. and no surprise- combo works better than mono therapy! We've been waiting for this one . T-Vec alone wasn't convincing in the past but this is the combination with Pembro. Unfortunately NO COMMENT on response rates!!!! 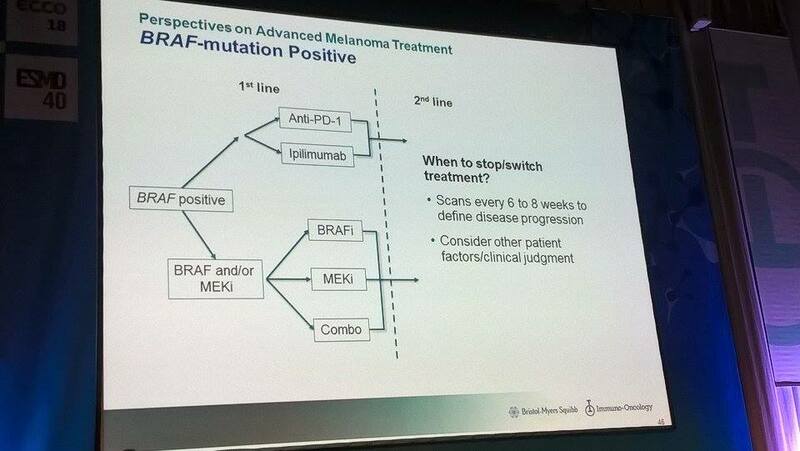 1 prior therapy allowed but no Immuno. 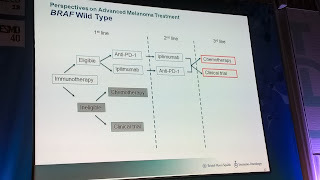 So- conclusion : Nivo then Ipi higher response rate than Ipi then Nivo but more side effects, similar to what one sees when Ipi and Nivo are giving at the same time. Caroline Robert commented- surprising as currently one thought that Ipi recruits T-cells that are then activated by PD1.